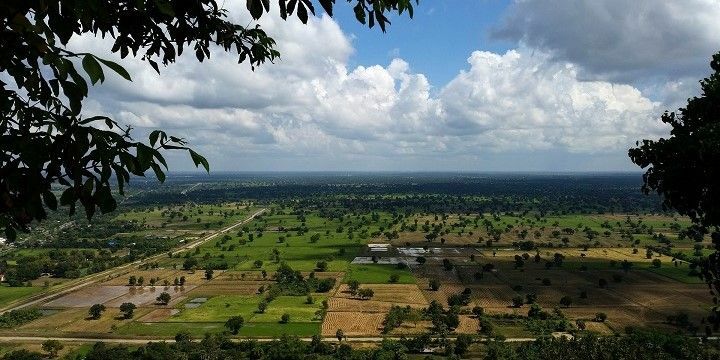 The region of the Cardamom and Elephant Mountains is located in the West of Cambodia, and stretches from Battambang in the North, to Kep in the South. This region contains some of Cambodia’s best natural beauty, including tranquil beaches, and incredible parks and forests. 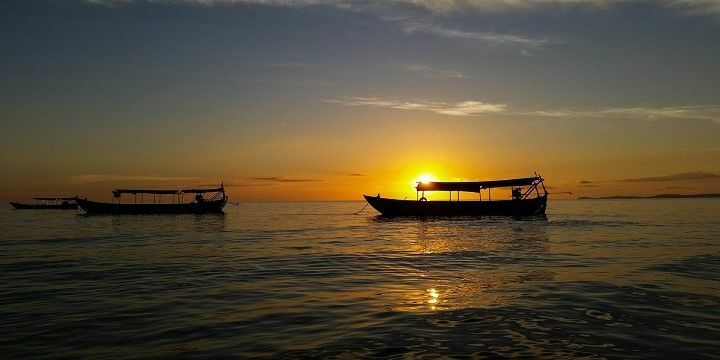 A 45-minute ferry ride from Sihanoukville in the Southwest of the region will take you to Koh Rong Island. Be sure to explore its 28 beautiful white sand beaches, as well as the High Point Rope Adventure Park, Cambodia’s first world-class high rope course. Stick around after dark to enjoy great beach bars and restaurants. Koh Rong Island is located just 45 minutes from Sihanoukville. If you’re looking for a less-crowded option, head to Koh Tonsay Island (also known as Rabbit Island), just a 25-minute boat ride from the coast of Kep. On this small, untouched island, you’ll find 600 meters of tranquil beaches, adorned with palm trees. What makes this island unique is that it has no electricity, it has banned motor vehicles, and has very few inhabitants, so it really is the perfect place to escape! Battambang, in the North of Cardamom, is one of the region’s most culturally interesting cities. Located on the Sankae River, Battambang is home to Sala Khaet, the old Governor’s residence. This European-style palace was built by Italian architects in the early 20th century to resemble the French colonial architecture in the city. Be sure to travel just outside of Battambang to see the temples of Wat Ek and Phnom Banan, which were both built by King Jayavarman II in the eleventh century. Battambang is one of the region’s most culturally interesting cities. While in Kampot (just east of Sihanoukville), check out La Plantation Pepper Farm to learn about another aspect of Cambodia’s history and culture. This peppercorn farm dates back to the 13th century, and still produces around 60 tons of pepper a year! The Cardamom Region is full of beautiful parks and unforgettable wildlife. Kep National Park for example, not only offers fantastic trekking routes, but is also home to Sunset Rock, one of the best spots in the region to see the sunrise, if you can get yourself there by 6:00 that is! Don’t miss the Connection Path Track, which will take you from the park to Kep’s Butterfly Farm. Ream National Park, meanwhile, lies about 17 kilometers outside of Sihanoukville and is over 200 square kilometers in size. It begins in Cambodia’s mainland, but also encompasses much of its waters, and many of its islands, too. Phnoum Mollou (274m) is the largest hill in the park, and the perfect spot for a hike. If you’re looking for more wildlife, the Kampot National Park is home to wild cats, and gorillas, and hosts spectacular waterfalls and great hiking paths, which will take you to 1,000 meters above sea level. As Cambodia’s only coastal region, Cardamom has plenty of spectacular beaches to offer, particularly in Sihanoukville. Occheuteal Beach is very popular, but an abundance of tourists can make it pretty hectic! 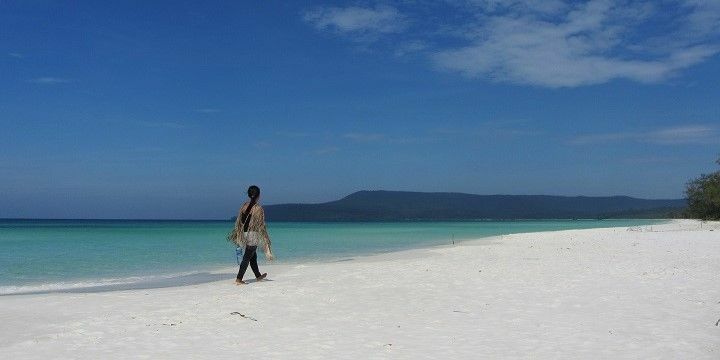 Quieter options include Serendipity Beach (a rocky patch at the northwest end of Occeuteal Beach, where there is a fireworks display every evening), and Otres Beach, which lies about five kilometers outside of Sihanoukville’s center is much cleaner and quieter. Sihanoukville features plenty of spectacular beaches. Kep Beach is located in the South of the Cardamom region. Relax on the white sands by bright blue waters, and check out the famous White Lady Statue. Legend has it, this naked female represents a woman, who was waiting for her husband to return from a fishing trip. It’s supposed to depict every Cambodian woman’s devotion to her husband and family. Great hiking routes, incredible views, gorgeous plants and some crazy monkeys, Kep National Park has it all! Just watch out for stray dogs along the way; they seem aggressive but their bark is generally worse than their bite! While in Kep, I’d recommend staying at one of the tiny bungalow/hut resorts. They’re mostly run by locals and make you feel really immersed in all of Kep’s natural beauty!